Most CSAs are one of two styles: Boxed, or Market. We use a hybrid of the two styles depending on the pickup location. Our Burlington pickup is Boxed, meaning that we choose items for people, then box them up individually. In contrast, our main pickups in Bristol and Hinesburg operate in the Market Style. At each pickup you will see a table of vegetables laid out, and a blackboard with a list of the week's items. Following the blackboard, you will take designated amounts of each item on the table. There will often be choice sections (choose 1 bunch of kale OR 1 bunch of rainbow chard). There will also be a farmer (usually Jake or Taylor) at each pick up to say hello and help make choices or give more information on the week's items. We have one main CSA share size that we call a "Regular Share". This share is made up of 6-10 different types of vegetables per week, with about a meal's worth of each vegetable. We think of our shares in terms of categories, and aim to have something from each of the following categories: a snack (carrots/snap peas), a cooking green (kale/spinach), salad fixins (lettuce/arugula), something substantial (potatoes/zucchini), an herb (basil/cilantro), an allium (onion/garlic), and tomatoes when in season. 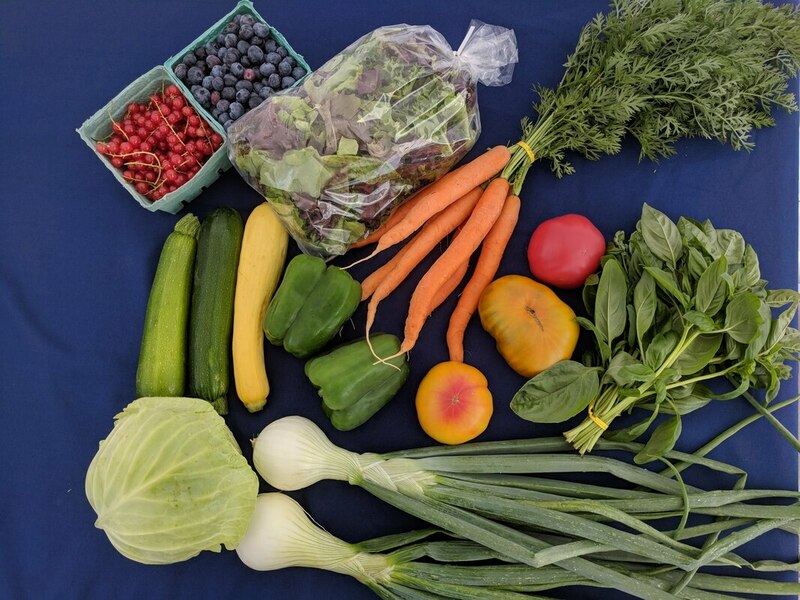 We find that the amount of food is just right for families with small children who cook 3-4 nights per week, for couples who eat a lot of vegetables, or for families with older children who are using the CSA more for side dishes or lunches for the week. We also have a "Mini Share". Mini Shares choose 3 items from the Regular Share list each week. Sometimes this list is limited, or the amounts are smaller, but is usually just "choose 3 from the week's items". This share is popular with families who have their own gardens and are looking to supplement with extra greens, or single person households. Mini Shares are limited to 10 members per season. All CSA shares start with vegetables, then you can add on a range of other staples. We source meat, bread and fruit from other local farms and businesses. Egg options are from our own farm. All add-ons are Organic (fruit, bread, eggs), or close to it (meat). We have chosen businesses that produce food with similar methods to our own, and we feel lucky to be able to bring our CSA members access to these excellent products. Click here to learn more about our Add-on options and partner businesses. For most of the year, pickups are Tuesdays (Hinesburg/Burlington) and Thursdays (Bristol) from 4-6pm. In 2019 Spring and Winter shares will be on Thursdays only at all pickup locations. Bristol pickups are at Tandem on Main Street. Hinesburg pickups are at Family Cow Farmstand next door to Red Wagon Plants. -added bonus: access to Family Cow's entire farmstand plus raw milk CSA! Burlington pickups ​are at a private residence on Park Street. Our CSA shares are $25 per week, or less if paid by check or if signing up for more than one season at a time. You will pay for your entire CSA at once, unless you are paying by payment plan or with EBT. This helps us invest in things like seeds and compost early in the season, and allows you to not worry about paying for your veggies each week. Our CSA price increases by 25 cents per week each year, which allows us to offer raises to our employees each season. We are members of NOFA-VT's Farm Share Program, which means that qualified families can get our CSA shares for 50% off. NOFA pays for 25% of the share, and we cover the other 25% with donations. Farm Share members can pay in full, by payment plan, or by EBT. For more information and dates for each season, please see our 2019 CSA Options.